In today’s data-driven age, it is important to find ways to stand out from the noise. For large companies this often involves allocating a huge marketing budget for SEO efforts, native ads, paid search and viral promotions. For smaller companies who do not have such opportunities, unconventional means of marketing, also known as guerilla marketing, can be a great way to create a buzz and increase traffic. Thinking outside the box is not that simple, but knowing where to start can facilitate the process. 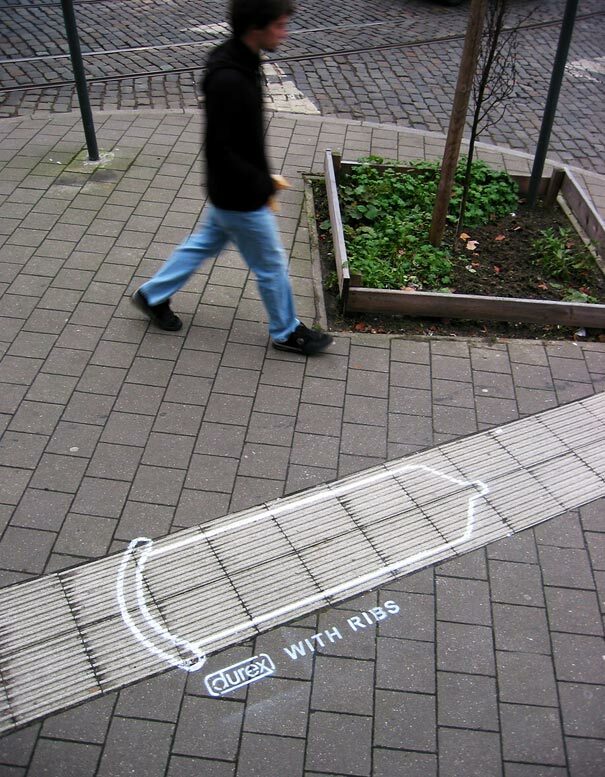 Here are some easy guerilla marketing ideas that are a good source of inspiration and are simple enough to adapt to your marketing strategy. Advertising is a great way to catch attention of your target audience. No wonder the global spending for advertising in 2014 was over US $500 billion! However, the cost of buying space for a billboard might not be in the budget of many small businesses. To mitigate this, companies can use environmental advertising, where the physical environment acts as the canvas or billboard for a businesses’ message. Take a look at some creative ways companies have done this in the past. 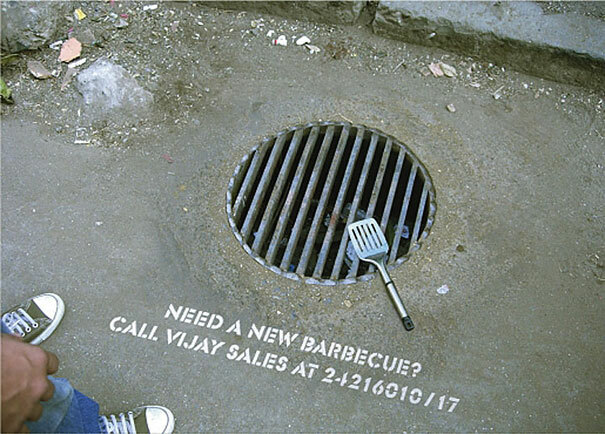 USING A SPATULA AND A DRAIN CREATES AN IMAGERY OF A BARBECUE GRILL. 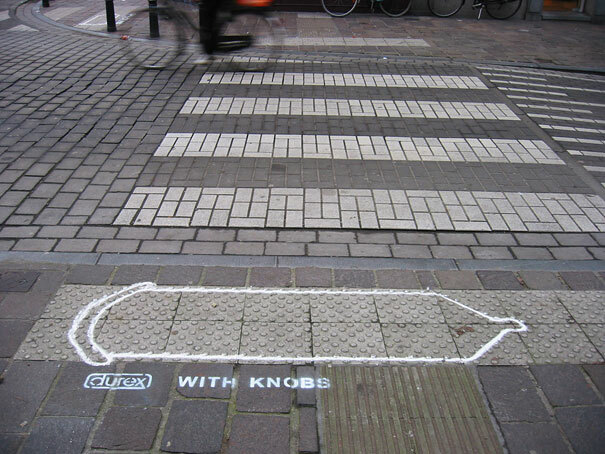 BRILLIANT USE OF THE SIDEWALK BY DUREX. Everybody talks about how businesses should be on social media to reach a wider audience. Since everybody and their grandparents have a social media page, it is important to find ways to stand out on these social platforms. This can be achieved by the type of content posted or the type of language being used. Another way to stand out is to be creative with the design of your social media page. Take a look at how some brands have used unique Facebook cover photos to make their pages stand out. Have a look at these Facebook and Google+ pages for more inspiration. Podcasts are a great way to create awareness for a wide audience. With these episodic series you can talk about content that is relevant to your industry and gains a following that you might not have had before. For example, a cleaning company can create a weekly series featuring most common mistakes that lead to a messier. Think about it as blogging but for the ears. Mashable does a great job at showing how small businesses have used podcasting to their advantage. Gamification might have been one of most popular marketing buzzwords used in recent years, which also has worked quite well for many brands. There are many sources about the benefits and implementation of gamification, and Nike does a good job at it. By using a community and a competition based tracking, it gets users to create a buzz around its new products and campaigns. Take a look at how they use gamification in their Nike Run campaign. Once you have come up with a cool marketing tactic, it should be captured on video and shared with the public. If you decide to do street art, show a video about how the street art was done. If you decide to create a podcast, show some scenes behind the footage from the show. 65% of your audience are visual learners and a video is one of the best ways to send a message and captivate your audience. Check out this video by Ballantine’s Whiskey showing how INSA (a graffiti artist they partnered with) created the world’s largest GIF image that can be seen from outer space. Hopefully these tactics and examples help you come up with some unconventional marketing ideas. What other easy guerilla marketing ideas would you like to add to this list?